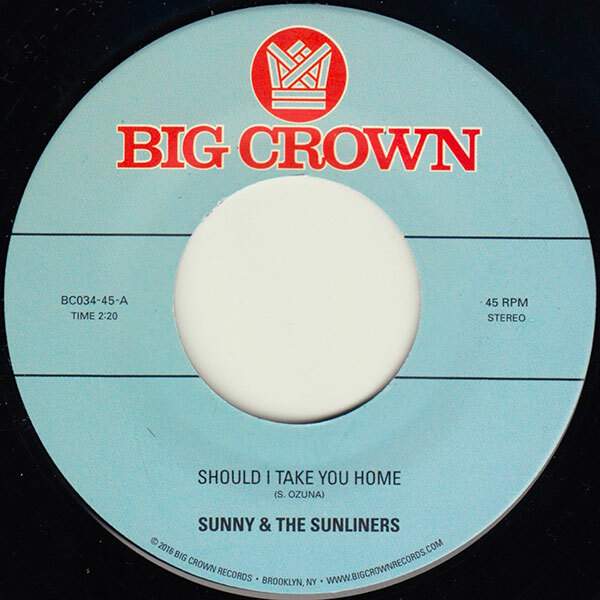 Big Crown Records is proud to present this killer two sider reissue from Sunny & The Sunliners. Sunny Ozuna, who formed his band, Sunny & The Sunliners, in the early 60’s, is a true legend in the history of not just Chicano music, but American music. Sunny “Mr. Brown Eyed Soul” Ozuna is highly regarded as one of the architects of the sweet soul sound that has been comped on countless “Lowrider Oldies” collec- tions, and his music has been pouring out of 1964 Chevy Impalas since, well, 1964. Side A’s “Should I Take You Home” is one of his flagship tunes that embodies everything that makes Sunny’s music so appealing. A mid tempo masterpiece that is as cool and swaggy as it is sweet and innocent. In his honeyed voice, that’s equal parts Little Wille John and Frank Sinatra, Sunny tells the tale of young love and it’s inherent defiance with lines like “there’s no excuse that she would understand, so when I take you home hold me by the hand”. When we asked Sunny about the tune he described it as “a very young thing, a cute thing”. There is undoubtedly something equal parts nostalgic and romantic about a young man puffing his chest out to authority for the love of his girl. It’s this blend of doo wop styled lyrics, B side soul ballad aesthetic, and Tejano vibes that makes this one of the biggest Chicano penned low rider tunes out there. Side B finds Sunny covering the Harvey Averne Classic “My Dream”. It’s another perfect example of the distinctive blend of Tejano music and American soul that makes Sunny & The Sunliners so unique. To say we are obsessed with the music of Sunny & The Sunliners would be to put it lightly. We have been working on a proper reissue project focusing on the for their music for a few years now and the full compilation will be out in 2017.